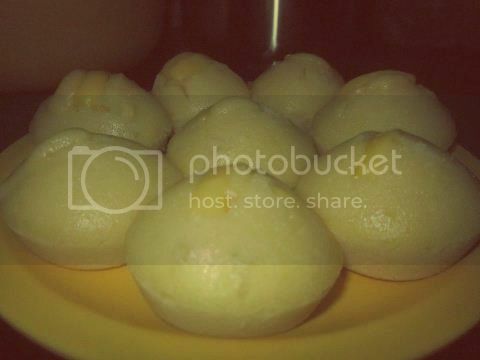 My friends in one of my Facebook group posted some pictures of different kinds of Puto, a steam rice cake in the Philippines. While looking at the pictures, I was reminded to grab my recipe notebook and look for my puto recipe. Sad to say, I couldn’t find my recipe anymore. I wanted to cook “Puto Cheese”, one of the variation for a puto recipe where flour is the main ingredient, not rice but I couldn’t find my puto recipe. Although I have memorized the ingredients, I can’t estimate the exact measurement of the flour, milk, sugar and many others. So, what I did I searched Puto Cheese recipe online and I found one. I tried PanlasangPinoy.com’s “Buttered Puto” recipe. While reading on the ingredients I can already tell that it’s a yummy puto. The only difference for this from the common puto cheese recipe is the Butter which makes it more delicious. Moreover, the use of quick melt cheese makes it more appealing in the eyes. So here is my “Buttered Puto” which I cooked a week ago. I’m sorry for a not so nice shot but when you got to taste it, you will surely ask for more. I wasn’t able to buy a quick melt cheese so I just used the ordinary one. If you want the recipe, you can drop your comments here or just watch the video below. Why Vegetables are Good for You?